Newton, NC – The Limited Late Models proved to be the division of the night, as drivers battled side-by-side for the top spot with Zach Bruenger the eventual winner. Even with an extended race, nobody in the Late Model division was able to catch Austin McDaniel who went unchallenged during the 100-lap event to take home first. 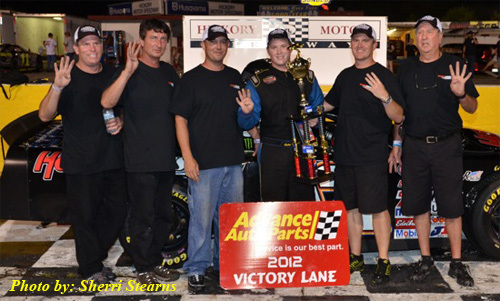 Charlie Neill, Zach Cochran, Street Stocks also brought home wins in their respective divisions. The much anticipated 100-lap Late Model race ran relatively smooth with only three cautions falling over the course of the race. No. 12 Austin McDaniel held a commanding lead the entire race, pulling away from the rest of the field with ease. Further behind in second, No. 43 Jesse LeFevers had his hands full with No. 97 Keith Bumgarner working to overtake him, hindered by a caution on Lap 39 due to a single car spin. Once again the field settled in place on the restart, quietly running in line until a late race caution on lap 89 fell with No. 8 Chandler LeVan coming to a stop on the backstretch. Nobody had anything left for McDaniel on the restart, giving him the win with LeFevers in second and Jeremy Sorel in third. Riding off of his success from last week, No. 55 Zach Bruenger found his way to victory lane for the second time, fending off early charges from No. 51 Jeremy Pelfrey and No. 7 Travis Byrd in the Paramount KIA Limited Late Model division. With Bruenger leading the field to green, Pelfrey jumped to second on lap 2 immediately putting pressure on Bruenger. As the field settled in position, Pelfrey looked to the inside of Bruenger on lap 16, but was unable to make moves. Watching the battle ahead, Byrd took advantage, closing in on the top two, but back-to-back cautions prevented Pelfrey and Byrd from finding their way to the front. Bruenger pulled away on the restart, riding content out front on his own. The final caution of the race fell on lap 28 with No. 15 Brandon Atkinson spinning on the backstretch. Pelfrey was loose in turn three on the restart, allowing Byrd to take over second on lap 32. Bruenger took the win with Byrd second, No. 00 Shane Lee third, Pelfrey fourth and No. 22 Dan Moore fifth. The Red Baron Renegades also put on a show for the fans with the top three drivers of No. 75 Charlie Neill, No. 8 Kenneth Roberts and No.16 Carroll McKinney in a tight battle for the lead. Neill was able to hold off his competitors, scoring the number one spot with Roberts in second. No. 02 Jason Cochran led start to finish in the Super Trucks and No. 03 Kevin Eby in the WrenchRags Street Stocks rounded out the winners of the night. Racing collides at HMS next Saturday, July 28 th with the arrival of Knights of Destruction Crash-A-Rama where fans can bear witness to school bus racing, a boat a camper trailer race, demolition derby and more! Gates open at 5pm with the event starting at 7:30. Advanced tickets are $15 for adults, $10 for children 6-12 and kids 5 and under free.